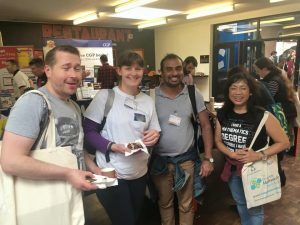 This blog post is a write up of my fourth maths conference. La Salle Education run the UK’s largest network of maths teachers’ professional development along with an online platform Complete Maths. 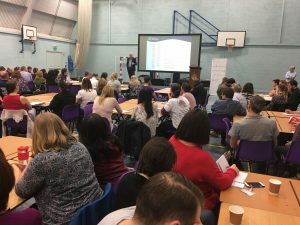 Attended by around 400 maths teachers and a few tutors, the conferences are invaluable professional development, training and networking with fellow maths teaching professionals. TLDR : All four workshops were phenomenal as standalone workshops. In the sequence I attended them, they compounded my learning even more. I have Friday tutees and Saturday is my busiest tutoring day. I wasn’t going to let that get in the way of going to #mathsconf17 though so I rescheduled many of my Saturday students well in advance. I took the train on Friday morning, checked into the hotel, set up my mobile online tutoring office (laptop + graphics tablet) and away I went tutoring until the evening. Selfie time with Mr Corbett! Fellow tutor friend and conference buddy Austin (@Lazyrunner78) arrived after a long evening of his own tutoring. We had a catch up and then made it to the bar late. The Friday drinks are always so welcoming, you can join anyone and instantly share your own enthusiasm of teaching amongst fellow teachers who understand the slightly crazy passion we have for teaching maths. I met some new teachers, both local to Birmingham and those who travelled. The friendly Mr Robert Smith was welcoming as always, introducing people to each other and keeping us all ticking socially. The Saturday was buzzing and La Salle CEO Mark McCourt opened the conference with an intro. His story on how the conferences started and his passion of empowering and bringing together maths educators set the scene for the day. We kicked it all off with mathematical speed dating. This was missing at #mathsconf15 so it was good to see the return. A speed date is talking to a teacher for two minutes about your best teaching ideas then hearing the teacher for two minutes. That’s one speed date, next you find a random teacher and then rinse and repeat four more times. Mark reminded us all on how a mathematical speed date in Birmingham led to a wedding two years ago. Love that story! I shared my own ideas on using manipulatives to teach from a mixture of algebra tiles to the meaning of pi experiment. Amongst my dates I met a teacher from Birmingham who was retraining from being a Chemistry teacher to teach maths. As it was his first conference he felt a bit out of place amongst so many seasoned maths teachers. I reassured him that I felt even more out of place at my first maths conference as a private tutor but now I know the community is super supportive. Since we both also taught Science it was so easy to go straight into common themes between the two. His speciality was Chemistry so we had plenty to talk about that. I had my big aha moment right at the end of the day too on maths and Chemistry. More on that later. 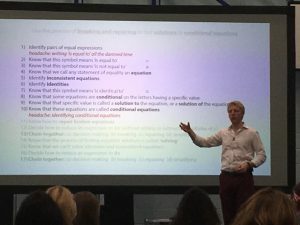 This is the second time I went to Douglas Butler’s (@douglasbutler1) talk, previously seeing him at #mathsconf10. This second helping was with a different flavour. He gave an overview of some of the items on this list. 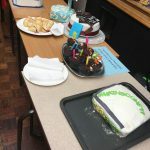 Maths cakes. Perfect for sugar rush. I have installed Google Earth pro on my computer after seeing it in action at this workshop. I use Google maps with tutees already to show them the similarity between New York’s grid layout and the x-y system. Google Earth Pro can do so so much more though. He showed the world’s largest equilateral triangle layout, parabolas, pentagon and the world’s steepest road. He also gave us all a hearing test. The airline industry is full of amazing data that can be used to show the perils of sampling data from a population. We also got a taster of Autograph and Excel. I am amazed by what those pieces of software can do. He finished off by making an animated version of the Starship enterprise from Star Trek to show 3D dynamic geometry in action, with music included! Douglas tells great stories and delivers with such great enthusiasm that you are drawn into the world of maths he reveals with the help of simple technology. I’ve got such great ideas from this workshop which will no doubt help my online maths tutoring for KS3, GCSE and A Level students. All that geometry and visual representation got me in the perfect mood for Singapore maths next. Dyscalculia and Singapore bar modelling are massive topics. I have been to day courses on both of them before. To deliver a concise idea of the two in one workshop was no small achievement by Judi Hornigold (@DyscalculiaInfo). Counters are a powerful tool in learning maths. I have totally immersed myself into tutoring and understanding Dyscalculia after going to a day workshop on it 3 years ago. Judi told us how we can better define Dyscalculia so that we can then address it. She also discussed that in many cases Dyscalculia might appear to be the issue when in fact it is maths anxiety. Anxiety triggers a fight or flight reflex shutting students down to learning maths. Again, maths anxiety is a huge topic on its own. So how can Singapore maths help? Students and teachers in Singapore had never heard of maths anxiety to her surprise. Judi went through a brief history of Singapore maths and then we got to the fun bit! 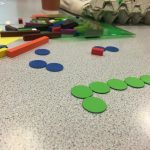 Using counters, cuisenaire rods, Singapore strips (of paper) – Singapore strips sure got some chuckles in the room. We looked at the bar model method itself for a range of situations from number bonds, ratio questions, linear equations in counters to the idea of metacognition for students. Metacognition is about building into students how and when to recognise when a problem can be reduced down and then solved in a different way, rather than applying an algorithm on autopilot. A quick example is on finding 12.5% of a large number without using a calculator. If students recognise 12.5% instantly as one eighth then they can divide the number by 8 instead. Singapore maths and bar modelling is changing lives for children. Judi had some amazing stories of students cracking things in maths. She had stories of students in tears of joy when they figured out concepts. I can relate to that as I had a Year 11 tutee who had battled with ratios all his life. It made sense to him after just half an hour when I used the bar model with him as the very first tutoring session I ever had with him. The utter delight and sigh of relief he had at understanding ratios is something I still remember so clearly. What an inspiring, well thought workshop. Inspiring low motivation students was just about to be covered in workshop 3. Julia Smith (@tessmaths) is a motivational power house, absolutely no doubt about it. She works with some of the least motivated students, those who have retaken GCSE maths and in some cases, are still retaking. She has found many ways of motivating students and has some excellent methods on how to help them revise and pass their exams. Re-vision workshop in the school music room. Julia started off the talk by clarifying that if students haven’t managed to figure a method out by the age of 15 and a high stakes retake exam is imminent, then it is time to re-visit the topic in a totally different way. If a method that works for them to give them the correct answer, then no matter how procedural or ‘quick fix’ the method seems, it is more than worth it to get the student to pass, gain confidence and go on to get a better paying career in life. She broke down the word Re-vision into re and vision. I had never thought about it this way so this was very refreshing. We also discussed possible answers to the “I hate maths” line from demotivated students and a tea towel of her revision techniques was given to one of her favourite responses. I am really torn when I have to teach to the test rather than teach for understanding. I will switch to teaching for the test in cases when I have to. To many of my students their dream might be to work in Veterinary Science, Sports Science, Nursing, Music Tech or something that requires that all important maths pass. I’ve got such students over the maths hurdle and it is truly satisfying. Amongst her top tips was the idea of double marking past papers, one with the real mark and the other with what the mark could have been with all slip ups and silly errors were given. Getting students to visualise tough moments in exams and to work out strategies to overcome those tough moments and to continue. Her centrepiece was her toolbox, which amongst other methods uses the marigolds of multiplication. This helps students to instantly figure out the times tables of 6,7,8 and 9. It works and will get students out of jail when they most need it, I really liked it! The other technique that I learnt was Vedic multiplication using just line strokes and counting for long multiplication. Again, what a superb technique. She also stressed that the way to do maths is to do lots of it, the importance of good exam technique and plugging gaps in the nine basics. 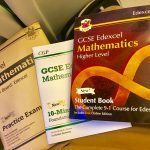 Corbettmaths revision cards were mentioned amongst mathsbot and a few other great revision resources. What came across so well is Julia’s energy and a can-do attitude to get her students over that line. I will take a lot away from this workshop and have new found courage to help my GCSE retake tutees. On to workshop 4. I was already primed for linear equations from the bar modelling workshop earlier in the day. Choosing this fourth workshop was a tough decision indeed. Between Jo Morgan’s workshop on solving quadratics, this one by Kris Boulton (@Kris_Boulton) and Pete Mattock’s one I had to pick just one. The title of this talk “How to solve linear equations, 100%, guaranteed” and a compelling description is what really sold it to me in the end. Perhaps the biggest motivating factor for me was that solving linear algebra equations is one of those pivotal key skills that once cracked, really gets students a firm grounding for algebra in general. I keep having to revisit it with some students. Kris started off with Al Khwarizmi. This is what I do when introducing linear algebra to students, so this struck a chord with me instantly. I ask students to google the origins of algebra and more on Al Khwarizmi’s book. We then talk about some of the words that come up, balancing, restoration, completion etc. Kris went into some detail about the appropriate use of the equivalent, equal signs and the word solve. He has ‘atomised’ the process of solving one step linear equations in some very fine detail indeed, 17 steps in fact. Breaking and repairing equations was the sort of language I have not heard in this context, so it really gave me food for thought. These steps could be put into component process pretty much independent of each other. I was sitting next to Austin for this last talk of the day and we both tried to come to terms with the idea of breaking an equation. This careful ‘atomisation’ and the early Chemistry moment suddenly gave me a Eureka moment. At GCSE Chemistry students are given equations to balance. These are broken equations because atoms are quite literally in unbalanced numbers on both sides. Balancing equations is a nightmare topic in Chemistry and Kris’s talk has given me an idea on breaking the process down rather than teaching it as one big process from start to end. There was a lot in this last talk of the day and by being forced to think in language I had previously not encountered I have taken a lot away from this workshop. It is so refreshing to see more tutors turn up to these conferences. 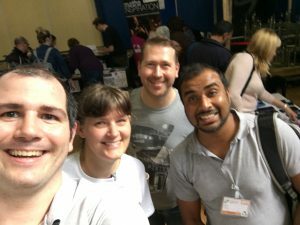 The Maths Tutors UK group has about five core members who attend these conferences and a new tutor local to the conference always joins in. It is vital that tutors get out there to such events as working in isolation has drawbacks. The rest of the conference was all about goodies from CGP, maths cakes, selfies with the legend that is Mr Corbett (we were in a long queue of selfie takers!) and all round socialising. In summary this was the best maths conference for me yet. On its own each workshop was perfection. By design or sheer coincidence the order in which the workshops followed one another complimented each other so well. Compounding at its best. Einstein wasn’t kidding when he said it is the eighth wonder of the world! The positive, supportive, can-do energy of these conferences is what bring me back to them each time. Endless thanks to the La Salle team and Mark McCourt for making this all possible. 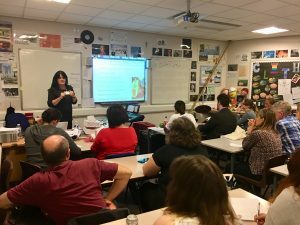 This entry was posted in Uncategorized and tagged birmingham, dyscalculia tutor, la salle education, maths conference, maths tutoring, online maths tutor on October 14, 2018 by Atul Rana.